Each year we attempt to surpass our lineup of Speakers; all to ensure that as delegates you receive the best possible opportunity for an educational, inspiring, and memorable experience. We bring in Speakers from across Australia, but also in every corner of the World. This guarantees a wide array of expertise, all in one place for the Parrots 2020 Convention! Over the coming weeks we will reveal new Speakers, so ensure you check back on this page or alternatively follow our social media pages for more updates. Neiva is a Conservation Biologist, the Hyacinth Macaw Institute President, Professor Dr in Environment and Regional Development of Uniderp, Coordinator of Hyacinth Macaw Project and Urban Birds Project – Macaws in the City (Projeto Aves Urbanas - Araras na Cidade). Neiva M. R. Guedes, graduated with a Bachelor in Biological Sciences by UFMS (1987), went on to obtain her Masters in Forestry Sciences by ESALQ/USP (1993), and polished off an impressive higher education portfolio with her Doctorate in Biological Sciences (Zoology) by UNESP/Botucatu (2009). Neiva is the President of the Hyacinth Macaw Institute. She is also the Professor of the Postgraduate Program in Environment and Regional Development of Uniderp University. Since 1990 she has been executing and coordinating the Hyacinth Macaw Project, where she has developed studies on the basic biology and monitoring of the species, Anodorhynchus hyacinthinus, threatened with extinction until December 2014, when it left the Brazilian List of Endangered Species but remains vulnerable on the IUCN list. In 2016 Neiva established a partnership with researchers from Bolivia and Paraguay for a Conservation Program of the Hyacinth Macaw in the Pantanal Biome. In 2011 she started the Urban Birds Project - Macaws in the City, where she studied the establishment of macaws in the city. She participates in the research line: Use and Conservation of Pantanal and Cerrado Biodiversity, with researchers from the Postgraduate Program in Environment and Regional Development of Uniderp University. Neiva promotes and coordinates education and environmental awareness activities with children and students and stimulates the Scientific and Pedagogical Tourism; as well as the citizen science involving the inhabitants in the activities of nature conservation. Neiva supports the Conservation Program of the Lear's Macaw in Bahia and supports and collaborates with the Spix's Macaw in Nature Program. She was part of the team of the Program of Monitoring of Hyacinth Macaws in Tocantins. Neiva was part of the team of the Conservation Project of the Hyacinth Macaws in the Carajás mosaic. Neiva supports the Art of Making and Recycling Project and the "Ponto de Cultura da Rede Morena Arte de Fazer e Reciclar" in Campo Grande-MS. She has experience in general biology, working mainly on the following subjects: Pantanal, Hyacinth Macaw, conservation, wildlife management, reproduction, observation tourism and environmental education. She published several works in chapters of books, articles in periodicals and annals of congresses; as well as lecturing extensively in Brazil and abroad. Neiva is the author of book "Blue Jewels across the Pantanal skies", with pictures of Luciano Candisani, launched in 2012 and is the author of six chapters of the book "Araras da Cidade - Música do Mato", of Thiago Quevedo, published in 2012. Neiva also supervises students in research projects, Scientific initiation, Masters, Doctorate and Post Doctoral. She is on the Board of Parrots International, based in Los Angeles. She is a teacher in the subjects: Biodiversity - Use and Conservation, Ecology of Ecosystems and Seminars (in collaboration). She is part of the Network of Specialists in Nature Conservation. John is well known as the owner of 'Cape Capers', a nature-orientated tour company focussing on Northern Australia. John first visited the Iron Range district on Cape York Peninsula in 1983. He was taken in by both its remoteness and beauty. Ten years later he returned with a 35mm film camera to begin recording what he saw. Little did he know how important these images would become 25 years later. Cape Capers has been strongly involved in scientific and conservation projects across Northern Australia, such as the Crimson Finch (impacted heavily by agricultural development), Golden-Shouldered Parrots, and the Palm Cockatoo (working with the Australian National University). While politicians and sceptics debated global warming and its effect on climate John has returned year after year photographing and filming his observations. The affect of unseasonal weather events and the forecast of them becoming more severe, more often now drives his desire to see a change in peoples' attitudes. John is one of a growing group of citizen scientists voicing their concerns about what they are recording. 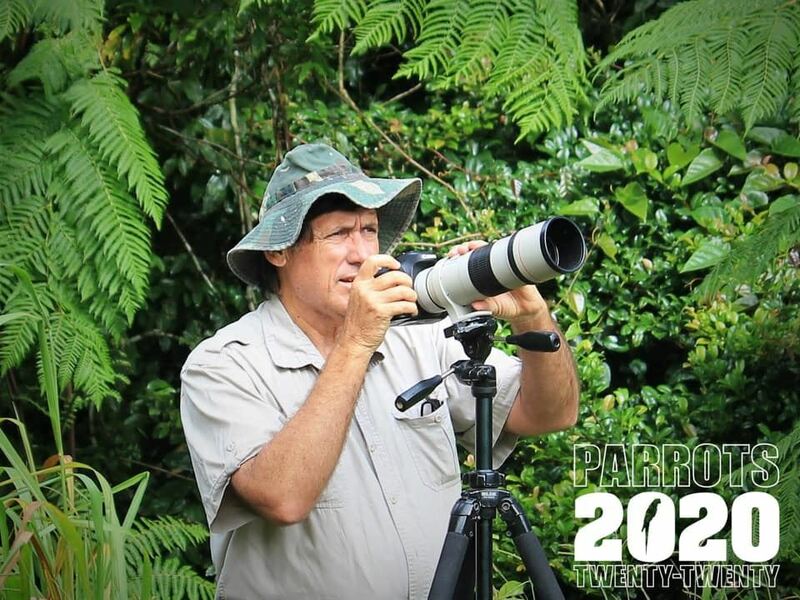 The presentations that John will provide Parrots 2020 with shall be on the birds of Northern Queensland, but also a presentation at the Conservation Dinner on climate change and its effect on the Australian subspecies of Eclectus Parrot. Marcia has a post-graduate degree in Wildlife Biology. She worked 26 years in ex-situ reproduction in Brazil, prioritizing always research and improvement of reproductive techniques. 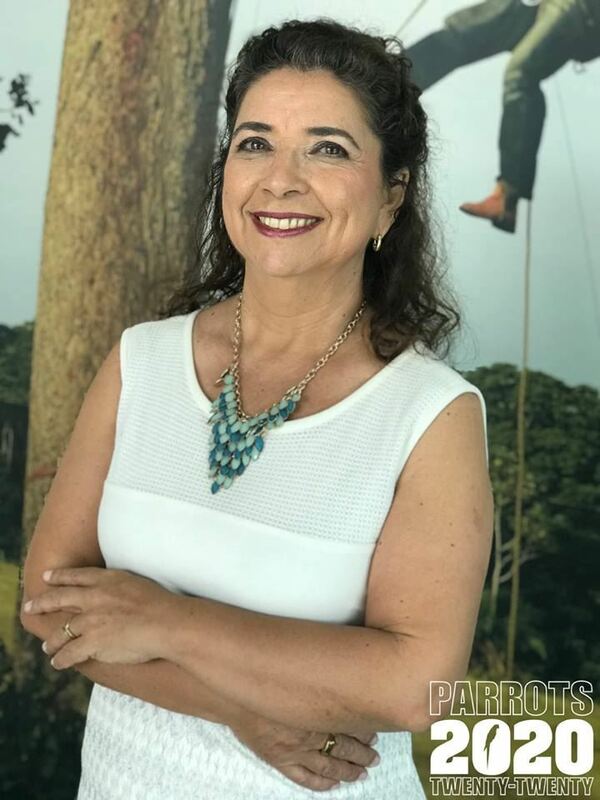 She has been in charge of the management of zoos and of the most important breeding centers of psittacidae in Brazil where she has obtained optimal results that have been published in various media. In September 2016 she accepted the invitation of Loro Parque and Loro Parque Fundación to be their bird Curator. Since then she has adapted the breeding methodology to the current reality. She assures that the development, adaptation and application of specific methodology for each breeding situation and species, are the main way to obtain the expected results. Today she is the consultant of the Reproductive Management Program in controlled environments of the Lear's Macaw (Anodorhynchus leari). It is a threatened and an endemic species to Brazil with which, the Loro Parque Fundación, has achieved an extraordinary breeding result thanks to the knowledge in optimizing the reproductive management of this and other species in similar situations. In 2018 LPF sent 6 Lears macaw for the first Lear macaw release project in Brazil and she prepare together with her team this 6 birds for the release program. 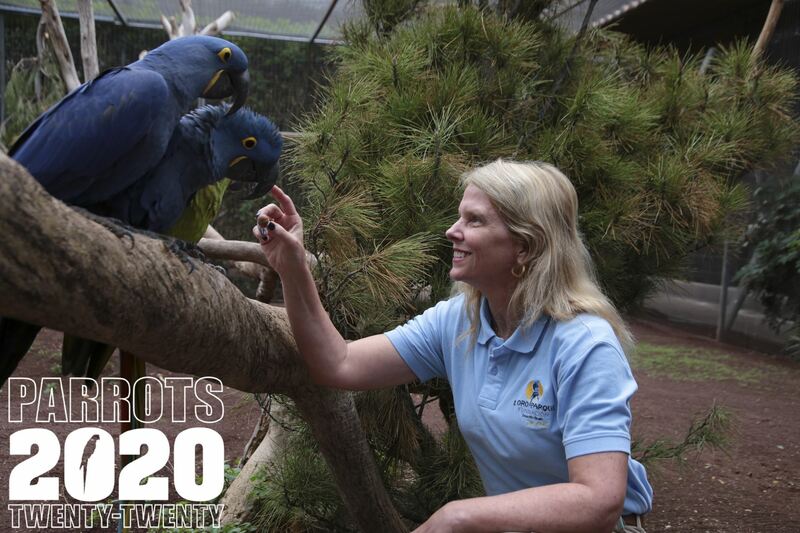 Marcia Weinzettl has lectured in different parts of the world showing her extensive knowledge of complex tropical psittacidae species of South America, outstanding among which is the management of the Hyacinth macaws (Anodorhynchus hyacinthinus) or the wonderful Golden conure (Guaruba guarouba) with which she obtained a relevant number of chicks.